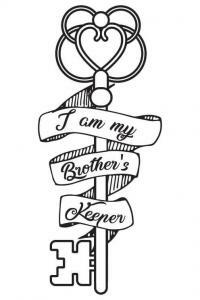 The words 'my brother's keeper' have a deep symbolic meaning that finds its roots in the Bible. The significance of these words is also meaningful for families and siblings. Therefore, it's not surprising that this powerful quote has found its way onto the skin of several ethnicities, generations, and groups. 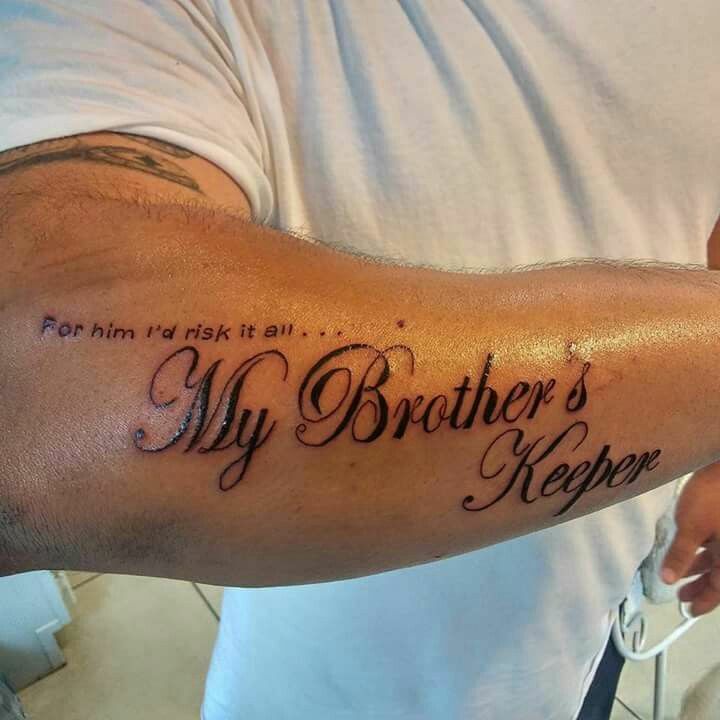 The words themselves might be simple enough, but the meaning behind 'my brother's keeper' tattoos is anything but. The most common meaning behind this quote is found in the story of Cain and Abel in the book of Genesis. In this story, God asks where Abel is after Cain has killed him. Cain replies, "I do not know; am I my brother's keeper?" The significance of these words extends far beyond the killing of Abel to the society as a whole. It shows the unwillingness of society to watch out for their fellow man. 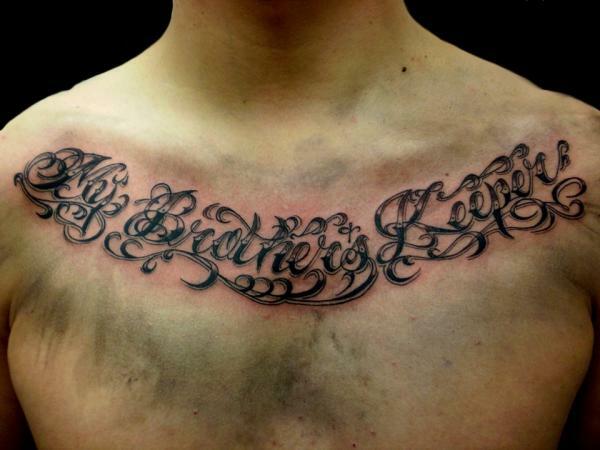 By tattooing these words, you can show that you are your brother's keeper. You will not only watch out for your family, but you will watch out for your society. This tattoo can also take on a deeper, more personalized meaning as a keeper among siblings and brothers in arms or with organizations. This tattoo signifies that you will watch out for your brother, blood or otherwise. You will do your best to protect him, guide him through life, watch his back, and take care of him. This also makes a wonderful remembrance piece for a brother that you lost too soon. So, whether you are watching out for your metaphorical brothers or your siblings, this might be perfect for you. 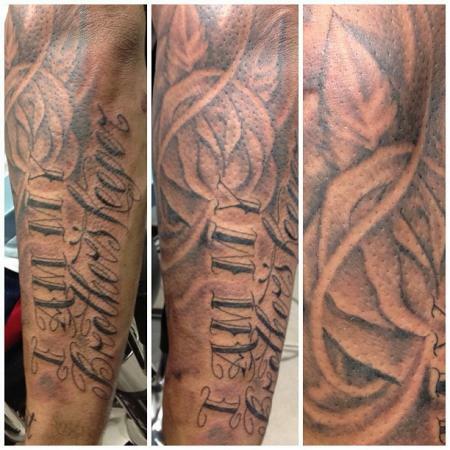 One of the single most popular places for this type of tattoo is the forearm. The long length and expanse of this area opens up the opportunity for different fonts and other elements of the design. 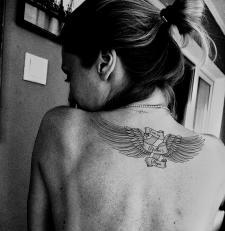 You might also think of using the back for this tattoo if you want to make it a larger piece and add different elements. This can work well for remembrance pieces that will include names and dates. The flow of the design also works well along the collarbone or on the chest over the heart. 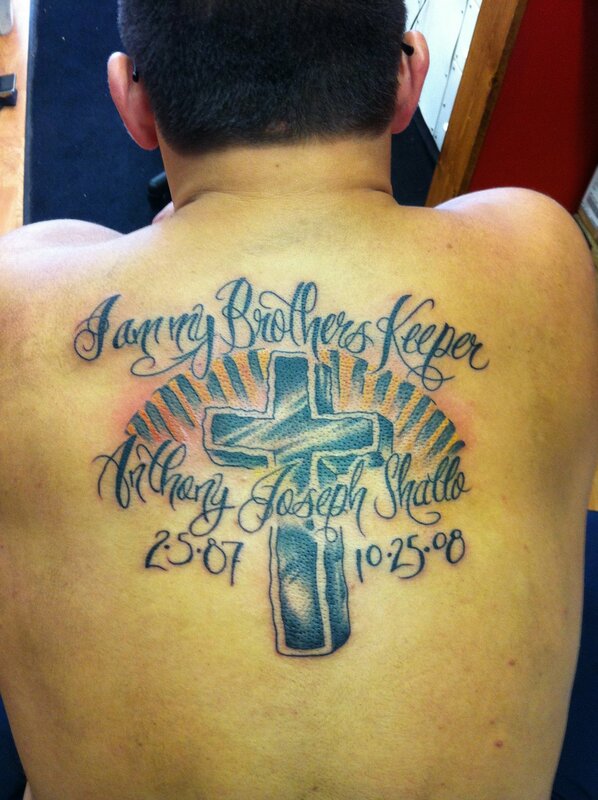 Having the tattoo placed over the heart adds to the symbolism, showing how your brother is your heart. Down the side of the body or along the rib cage also works well if you want to follow the flow of the design and add other distinctive elements. For example, maybe you'll add a heart and a key or you might choose to make the words into the base of a key design. Now that you know some of the best places to put your symbolic tattoo, finding the perfect look is just around the corner. My brother's keeper pieces take all shapes and sizes, from simple words to intricate images that define the person that you are vowing to protect. 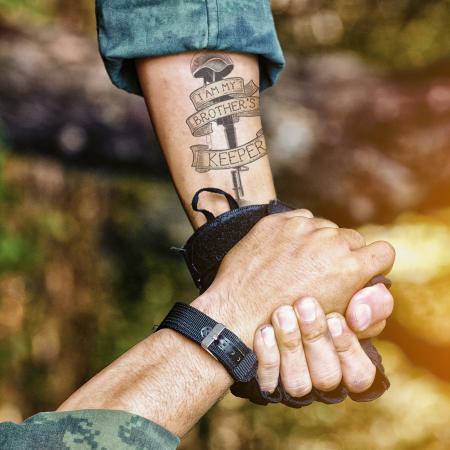 Additionally, this tat typically distinguishes itself with its use of military elements like the helmet propped on the rifle signifying a fallen soldier or the words wrapped in a banner with dog tags hanging down. While this tattoo opens the door to different details and embellishments, you can keep it simple with words in a simple script font or block text in bold black ink. This tattoo looks clear and crisp on the skin. You can also spice it up by adding color and other elements like gray wash and shadows. Images also add to the overall significance of the word tat. For example, flowers can signify healing, love, peace, and even death. Another fun version of this tattoo is a sibling design. You can either have just the words or you can choose to add decorative elements. 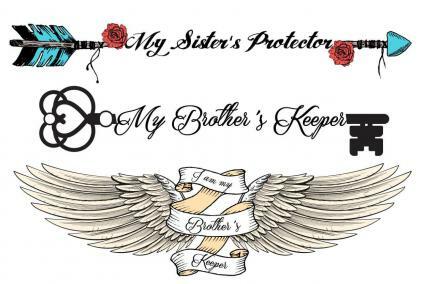 The most common is the arrow on the 'my sister's protector' and key on 'my brother's keeper.' This tat shows how family watches out for and protects one another. 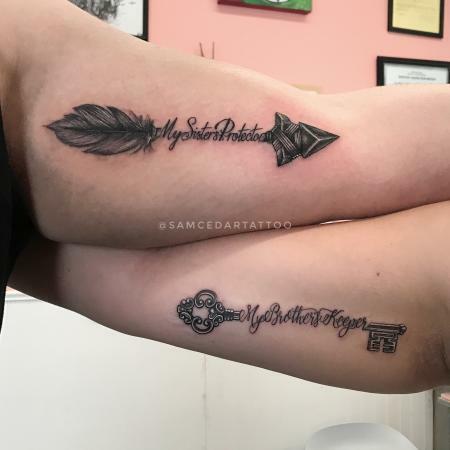 While the words in this tattoo are similar, the designs available are not. If you are considering this type of work, you need to think about it carefully beforehand. Examine what you want this piece to mean. Do you want this to signify your commitment to your religion and society? Is this a very personalized piece for a loved one? The answers to these questions can help you to figure out the way you might present the tat and where you want to put it. If this is to signify a loved one, you might want to put this in an area that you see all the time like your forearm or on your chest by your heart. Analyze the elements that you would like to add. For example, you might choose to add the words to a landscape piece with a lake and cabin that was important to you and your brother as children. Maybe you want to add a key element to show how your brother will always hold the key to your heart as your first best friend. Size is important. This is a very personalized piece that represents something to you. The size that you choose to have it can add to your meaning. 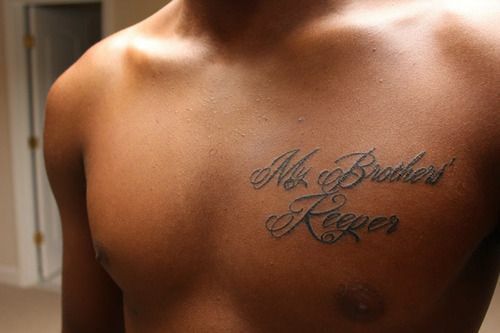 The words 'my brother's keeper' are a popular tattoo phrase found in many circles. These words hold deep significance, with roots in the Bible, as well as individual meaning. While placement is pretty much limitless for word tats, you'll find this design commonly placed on the forearm, chest, back, and rib cage. If this is a design that you think you'll love for a lifetime, find an artist and get inking.